Vital had 17 points in the first half, hitting six of his first eight shots, including four 3-pointers. The Huskies built a 32-9 lead after a short jumper by Kassoum Yakwe, before Lowell began chipping away. Hurley said it was apparent the Huskies lost the appropriate respect for their opponent and with it, the team’s focus. The Huskies refocused after intermission. Adam’s pushed the lead to 13 on a traditional 3-point play to open the second half. A 3-pointer by Gilbert made it 75-53 with just under 10 minutes left and UConn cruised to the finish. UConn: Sidney Wilson made his long-awaited debut for the Huskies with just under nine minutes left in the game. The 6-foot-7 forward transferred from St. John’s after spending just part the summer of 2017 at the New York school. The NCAA denied his waiver request, forcing him to sit out last season. UConn suspended him for the start of this season for an unspecified violation of university policy that occurred last year. He had three rebounds, a turnover and missed a dunk in just under five minutes on the floor. “It was Sid’s first seconds in college basketball, first minutes in college basketball,” Vital said. “Once he starts understanding and gets his feel back for playing in games, you all are going to see a Sid you haven’t seen before, I promise you that,” Vital said. UMass Lowell hit just two of its first 11 shots, but finished shooting 49 percent from the floor, including 10 of 24 from 3-point range. Carlton has now had three games this season of 15 points or better for the Huskies. 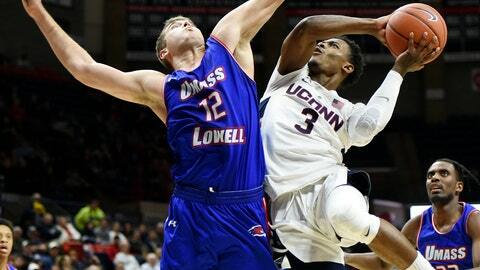 UConn’s big man also had seven rebounds and three blocked shots on Tuesday. The Huskies outscored Lowell 54-24 in the paint and outrebounded the River Hawks 40-32. UConn: The Huskies host Arizona in what coach Hurley calls a high-leverage game on Sunday at the XL Center in Hartford.